It's not a powerful rig, but it is a good entry into something that sounds decent. And it has the most amount of value-for-money. If I had the chance and the money to start from scratch again I would gladly go for this. 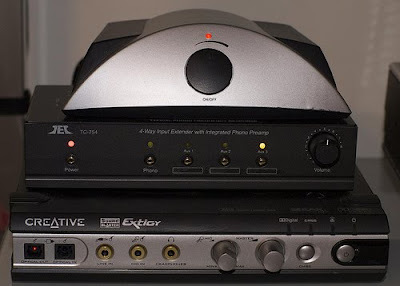 Sadly, the Sonic Impact T-Amp is not value-for-money anymore, far from it in fact - it was super when it was sold for USD$39, but soon after, no doubt due to some audiophile/"audiophile" sites hyping it (especially this one with its adsurb claims, btw quite a few items had increased in prices to become overpriced after their reviews were published by this site, I'm not even sure whether they look at performance or money paid under the table), it was asking for at least twice as much (and the T-Amp 2 asking 4 times, without any significantly more effort put in). At those prices, there are many better alternatives from China. And two (non-Chinese) ones made it into Singapore - JAM Acoustics Audio Amplifier using the famous Tripath TA2024 chip selling for $79, or $59 without PSU and Scythe Kama Bay amp using YAMAHA YDA138 selling for less than $100 at the local distributor of Scythe products Alex Tav. In the end (or rather, before those choices were available), I got a chance to buy an Yulong for $100 and another one for $120. I'd rather go for something with a toroid. And bigger caps. Back to not talking about myself, the rig on top is worth less than $200 in current monetary value (if hyping does not take place and prices are what they should be selling at second-hand - Extigy goes for less than $40, do not have any hope for the T-Amp - it should sell for at most its ex retail price, anything more you can go for the newer better alternatives - the preamp is worth max $100 - around $150 new & shipped), yet in economic value (as in the amount of enjoyment) it is worth a whole load more. Actually you don't need a lot of money for something with decent sound - $100 for an amp, $100 for a pair of old passive speakers, and you're good to own. Way more so than Aego M, Klipsch Promedia GMX, Creative T3. Maybe not all-roundedly especially in the bass department, but stretch the budget to $300 and some creativity and you will.